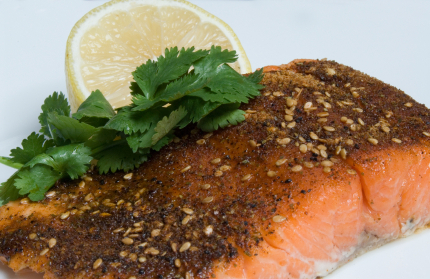 If you like spicy, you'll love this restaurant Blackened Fish Recipe. Be warned ...it creates a lot of smoke and heat. 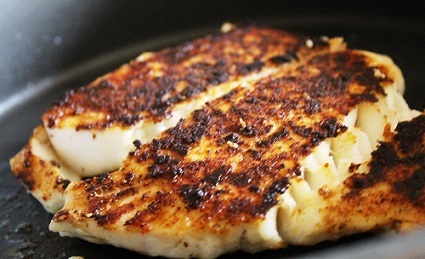 If you don't have good ventilation, heat your cast iron skillet outside on your grill. If you are using blackened seasoning from the store, grind it in a coffee or seed grinder or use a mortar and pestle until fine. Serve topped with Lemon Herb Butter and with Squash Creole. Please tell others who like to cook with confidence and style about these real restaurant recipes. Check back often ...additions made regularly! Thank you very much for finding the website and this restaurant recipe. I know you'll be pleased with the results. 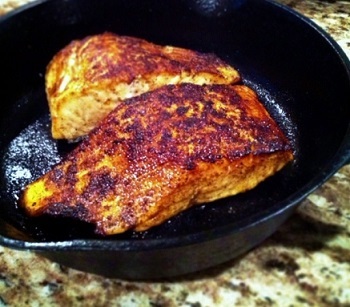 Enjoy your blackened fish and the company of those you share it with! Did you know? The largest private employer in Alaska is the seafood industry.